After purchasing Dynamic Submission™ you will receive an email containing your registration code with detailed instructions on how to use it. Click on Help -> Register from the menu bar, and then enter your register Name and Registration Code to register your program and upgrade it to the full version. Check your internet connection setting and make sure you are connected to the internet. Check your "Register Name" and make sure you enter the Register Name EXACTLY as shown in the "Order Confirmation" email. Make sure the registration code you entered is EXACTLY as provided in the "Order Confirmation" email. The key is case sensitive and contains no space. Use the "Copy" and "Paste" function to enter your registration key easily. 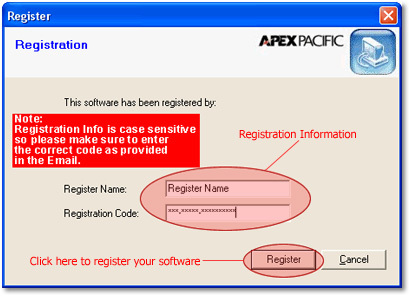 After entering the Register Name and the Registrer Code Click "Register" Button to register your software.